Miami Trace’s Billie Jo Seitz takes a swing at a pitch during a Frontier Athletic Conference game against Chillicothe Monday, April 15, 2019 at Miami Trace High School. The Miami Trace Lady Panthers varsity softball team hosted the Lady Cavaliers from Chillicothe High School on a sunny, yet chilly Monday, April 15. Miami Trace run-ruled Chillicothe, 11-0 in five innings. The win keeps Miami Trace on top of the Frontier Athletic Conference standings at 5-1. The Lady Panthers are now 11-2 overall. Olivia Wolffe pitched five innings for Miami Trace to get the win. She allowed no runs on two hits with nine strikeouts and no walks. Julia Hall took the loss for Chillicothe. She pitched four innings with 11 runs (nine earned) with 10 hits, one strikeout and two walks. Miami Trace scored one run in the first and that proved to be the winning run. 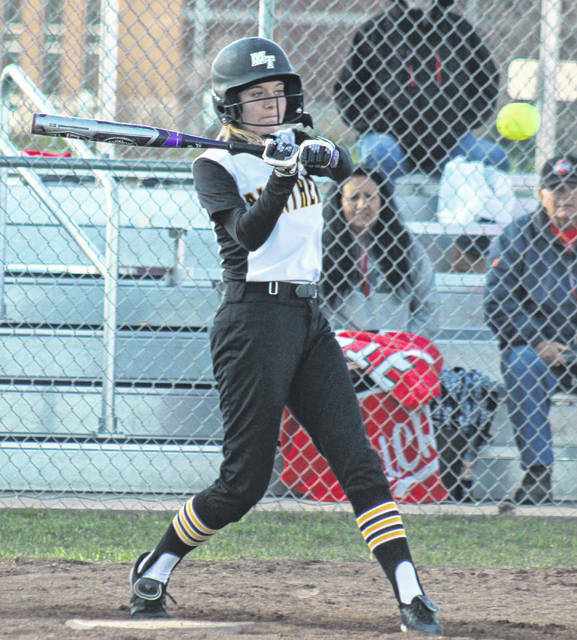 The Lady Panthers sent 14 batters to the plate in the second inning, scoring nine runs. Miami Trace tacked on one run in the third inning. Jessica Camp went 3 for 3 with two doubles and two rbi. Kaylee Hauck went 2 for 3 with a double, one rbi and two runs scored. Maddie Mossbarger had two hits and scored twice; Kylee Rossiter had two hits, including a triple, two rbi and one run scored. Wolffe, Ashley Campbell and Aubrey Schwartz also added hits to the Miami Trace offensive attack. Cunningham hit a double for Chillicothe and Fromm had a single. “Everyone swung the bat well tonight,” Miami Trace head coach Joe Henry said. “We’re starting to pick it up now. We hit pretty well Saturday, too. Miami Trace is off Tuesday and plays at Mitchell Park in Greenfield against McClain Wednesday at 5 p.m.
Offensively for Miami Trace: Kaylee Hauck, 2-3, 2b, 1 rbi, 2 runs; Hannah Miller, 0-1, 2 runs; Olivia Wolffe, 1-3; Jessica Camp, 3-3, 2 2b, 2 rbi; Ashley Campbell, 1-3, 1 run, 2 bb; Sidney Payton, 0-3, 1 run, fc, roe; Aubrey Schwartz, 1-3, 1 run, 2b, 3 rbi; Maddie Mossbarger, 2-2, 2 runs; Billie Jo Seitz, 0-1; Breanna Eick, 0-2, 1 rbi; Piper Grooms, 0-1, 1 run; Kylee Rossiter, 2-2, 3b, 2 rbi, 1 run; Devin Thomas, 0-0, roe; Krissy Ison, 0-0.